So a while back I was wandering around Boston, and saw this little gem of a sign. I couldn't help but snap a phone-cam shot of it. I thought I'd have a wacky photo to share with the world. Little did I know that I was hardly the first person to snicker at this particular sign. How unoriginal. 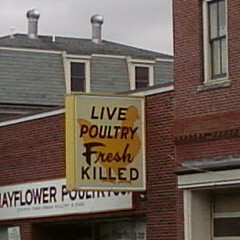 The shop, Mayflower Poultry, apparently does sell chickens that are slaughtered on-site daily. They also sell a variety of merchandise emblazoned with the (ostensibly) famous graphic. Call me old-fashioned, but I can't help but find the live poultry, fresh killed thong underwear more than a little disturbing. I'm glad to see this post.